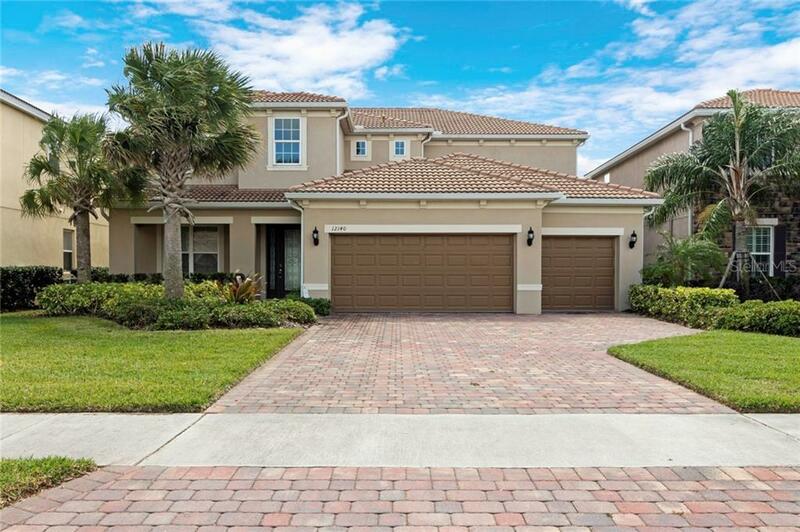 Located in the desired Guard Gated Community Villagewalk @ Lake Nona, this waterfront home sits on a premium lot and effortlessly blends with nature that welcomes into a modern 4 bedrooms, 4 and a half bathroomsâ interior, designed for entertainment and privacy. Tile flooring stretches throughout the public and entertaining areas, seamlessly complimenting the open design shared among the living, dining, family room and kitchen. At the center is the kitchen featuring upgraded appliances, a cook island, wood cabinetry with undercover lighting, granite and a breakfast bar that does not replace, surprisingly, the traditional space for dining table. Carpet starts by the stairs leading to the master featuring a suite bathroom with dual-sinks, walk-in shower, tub, and windows overlooking the pool. A small bonus room by the laundry for infinite uses! Studio room on the lower level to be used as a guest room, a work area, leading to the entrance hall. Backyard cleverly designed for entertaining or simply relaxing with an amazing visual of the outdoors. A pool/spa bath with a full bathroom for convenience. Plenty parking in the large 3 car garage. All information contained herein has been deemed reliable but not guaranteed. Buyer/Agents to perform all due diligence and investigation to verify.